The EBC Brakes® Yellowstuff compound is a high performance road pad that is also suitable for race use and works really well from cold. If you want the ultimate in high friction braking, this is the pad to choose. Brakes feel superb from first touch of the pedal and stay effective right up to race temperatures.EBC Brakes® Yellowstuff is designed for faster high horsepower cars where maximum stopping is the prime requirement and for track use. The dust rating is less than OEM parts. Where necessary all pads come with edge chamfers, noise reduction shims and OEM hardware. 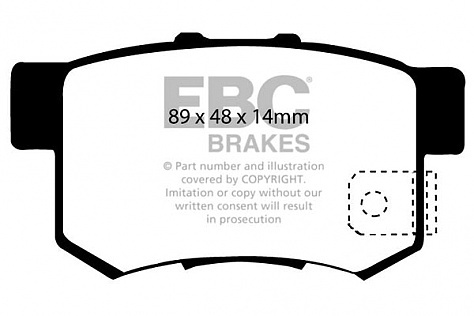 All EBC Yellowstuff pads feature the EBC Brake-In™ surface coating which helps pads to seat quickly after installation.